Russell Christopher Hofstad, 25, was sentenced to two years in prison and four years probation over animal cruelty and burglary charges. 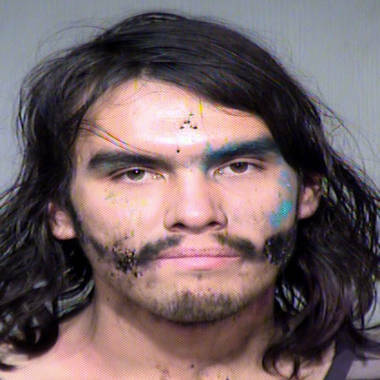 PHOENIX -- An Arizona drifter who skinned a cat and wore its tail and innards around his neck was sentenced to two years in prison on Wednesday. An Arizona Superior Court judge also sentenced Russell Christopher Hofstad, 25, to four years probation on his release, the Maricopa County Attorney's office said. Hofstad pleaded no contest last month to a felony animal cruelty charge and guilty to a burglary charge. According to the criminal complaint, police arrested Hofstad in January after he broke into a Phoenix warehouse used as a music venue. Officers found the skinned and gutted remains of a cat inside, and Hofstad wearing the cat's tail and a piece of its "internals" around his neck on a rope, with his face painted. Police said he had eaten parts of the cat, while some of its other internal organs were kept in a cooler. Hofstad told police he had recently been released from jail and had nowhere to live. He said he had not eaten in a few days, so he hit the cat with a stick and then stabbed it. He planned to stuff the animal and save the skeleton "for a decoration for a party."